MR. FRANK ANDREW, of Pencoys, formerly of Lanner, who is missing. There is now no hope that he was saved. On Sunday evening at St. Andrew's Church, the vicar (the Rev. R. Prior) preached an impressive and appropriate sermon to a large congregation. Taking as his text Psalm cvii., verses 23 and 24 he made special reference to the Titanic disaster. 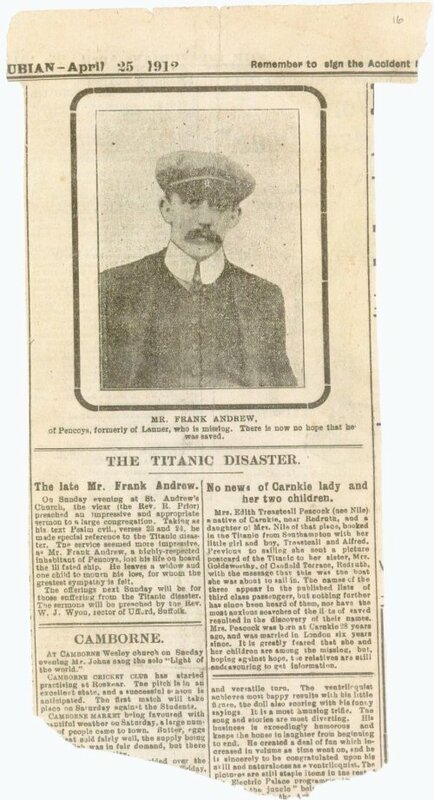 The service seemed more impressive, as Mr Frank Andrew, a highly-respected inhabitant of Pencoys, lost his lfe on board the ill-fated ship. He leaves a widow and one child to mourn his loss, for whom the greatest sympathy is felt. The offerings next sunday will be for those suffering from the Titanic disaster. The sermons will be preached by the Rev. W. J. Wyon, rector of Ufford, Suffolk.